Vietnamese President Nguyen Minh Triet paid a working visit to the northern mountainous province of Tuyen Quang on June 30 and July 1, focusing on its socio-economic development in the first half of 2010 and implementation of a Politburo resolution on judicial reforms. Working with the provincial leaders, President Triet praised the province’s efforts in socio-economic development, particularly its important and comprehensive achievements and high growth rates in recent years. The President cited Tuyen Quang’s gross domestic product (GDP) growth rate of over 14 percent in the first six months of the year and its projected per capita GDP of 702 USD in 2010. The province has already completed 20 investment projects and is currently carrying out 12 others, while its industrial production value is estimated to exceed 2.2 trillion VND. “Tuyen Quang is one of the fastest-growing north-western provinces,” he said. Regarding Tuyen Quang’s socio-economic development solutions for the 2010-2015 period, President Triet asked the province to mobilize and use effectively available resources, speed up economic growth and accelerate development of industries in which it has advantages. The province also needs to develop the service as well as agricultural and forestry sectors towards the direction of producing commodities, he added. Tuyen Quang holds advantages in terms of farming land, hence the province should step up forestation and make the best of its forests to create favorable conditions for local farmers to enrich themselves, the leader said, adding that Tuyen Quang must also expand the pilot model of raising cows. President Triet also requested concerned ministries and agencies to consider the building of an expressway that links Tuyen Quang and its neighboring province of Phu Tho with the Kunming (China) - Lao Cai -Hai Phong economic corridor, thus facilitating Tuyen Quang’s endeavors to attract more investors and boost socio-economic development. In his capacity as Head of the Central Steering Committee for Judicial Reforms, President Triet urged Tuyen Quang province to effectively perform judicial reforms in line with the Politburo Resolution 49-NQ/TU, renew the working procedures and improve the operational efficiency of its judicial agencies. 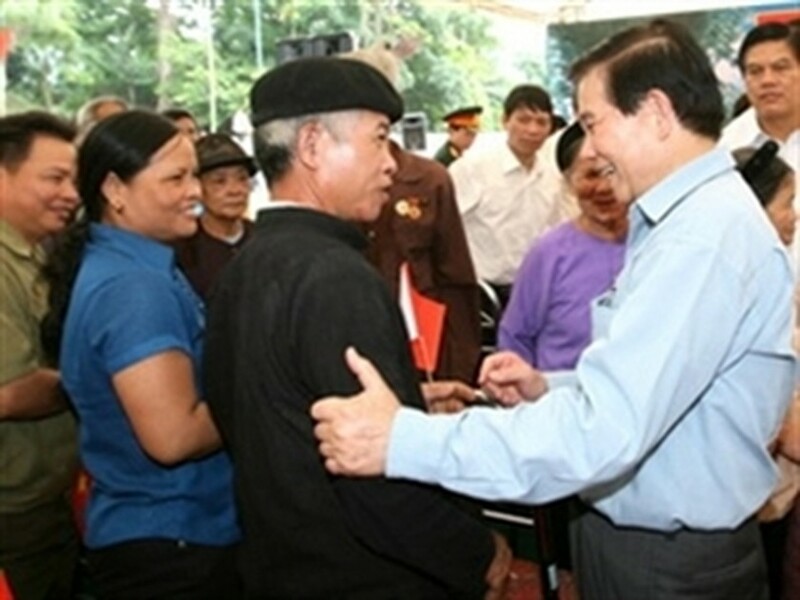 During his trip, the State leader visited the Tan Trao historical relic site and met with local people in Son Duong district’s Tan Trao commune - a former revolutionary base. He also visited and presented gifts to Vietnamese heroic mother Nguyen Thi Nhon, families which had made great devotion to the nation and veteran revolutionists in Tan Trao commune and Tuyen Quang town.